Roast a whole head of garlic in a 400 degree oven for about an hour until its soft and fragrant. Peel the majority of the skin off the garlic head and cut the top quarter of the garlic head off. Place onto a piece of tin foil, drizzle with olive oil and roast. Once it has roasted and cooled, squeeze out the cloves and mash with a fork creating a paste. Cook your quinoa according to directions. I like to cook mine in chicken broth. Dice the onion and sauté in a bit of butter and olive oil on med/low heat for about 30 minutes until they have become carmelized and nicely browned. Toast the almonds in the oven for about 6 minutes at 300 degrees once the garlic is finished roasting. In a large bowl, mix the creme fraiche, dijon and garlic paste together. This will be the sauce for your dish. 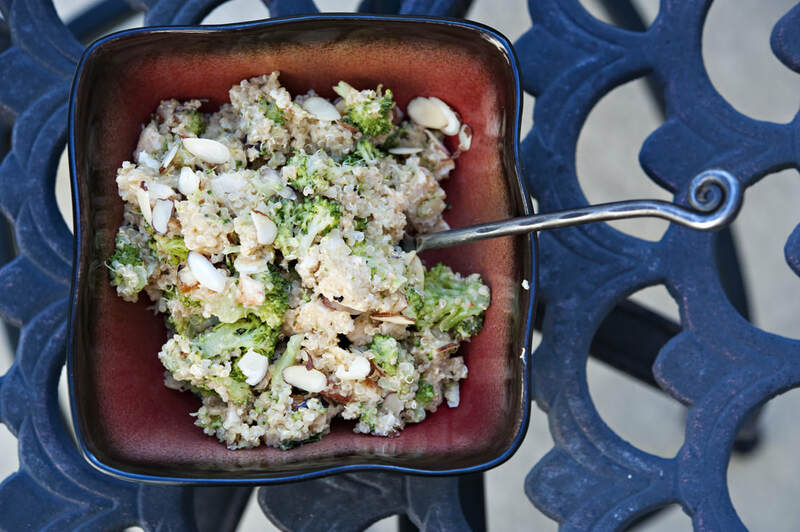 Gently mix in the quinoa, grilled chicken, onions and broccoli in the creamy dijon sauce. Season with salt and pepper. Sprinkle the almonds on top. Done!